Jane Bannahan Hawthorne passed from this earth peacefully in her sleep, Friday, January 25th, at her home of fifty-nine years, after living what she truly believed was, a life blessed by God. She was born June 6, 1920 in New Orleans, Louisiana to James Owen Bannahan Sr and Clare Burke Bannahan and they moved to Houston, Texas when she was a young girl. In 1942 she married the love of her life, Cooper Franklin Hawthorne in Lubbock, Texas where he was stationed in the Army Air Corp at the time. Jane and Cooper were blessed with four children from their union; Cooper Franklin Hawthorne Jr, James Michael "Mickey" Hawthorne, Mary Margaret Hawthorne, and Sally Hawthorne Roane. Jane was an avid and excellent golfer and bridge player and was one of the first Gray Ladies volunteer at St Elizabeth Hospital. 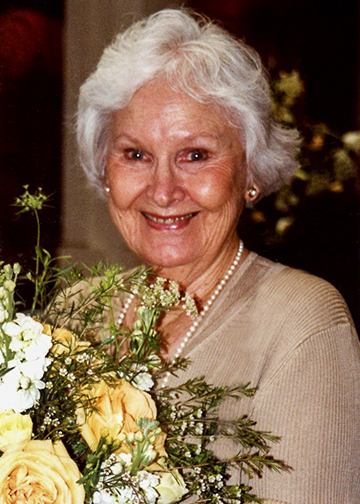 Jane is also survived by seven grandchildren and seven great grandchildren, as well as son-in-law, William Arthur Roane Jr.
She was preceded in death by her loving husband, Cooper F Hawthorne Sr, after 62 years of marriage, her oldest son, Cooper F Hawthorne Jr, and brother, James Owen Bannahan Jr. The family wishes to thank Compassion Hospice nurses and staff for their excellent care. And most especially wish to thank Lynn Palermo, Cristy Joy Del Rosario, Pat Cox, Chinky Flock and Dori Cruz for their friendship and thoughtful care of our mother these last two years. In lieu of flowers please make a donation to St. Anne's Catholic Church, 2715 Calder Avenue, Beaumont Texas 77702. A Mass of Christian Burial will be celebrated at 1:00 p.m., Wednesday, January 30, 2019, at St. Anne Catholic Church, 2715 Calder Avenue, Beaumont, with her interment will follow at Forest Lawn Memorial Park, Beaumont. We are thinking of you and your family as you celebrate your Mom's remarkable life and the memories you shared, May the peace and love of Christ find you during this difficult time. Beaumont has lost a truly gracious lady. Prayers for all! Her life was a testament to a life loved well!